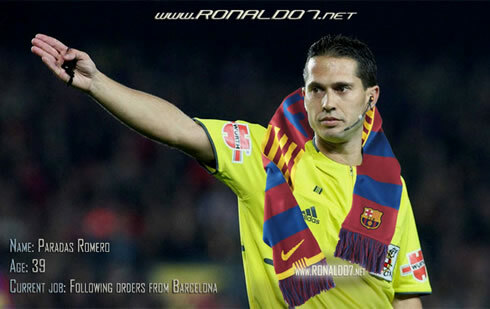 ﻿ Villarreal 1-1 Real Madrid. Could it be more controversial? 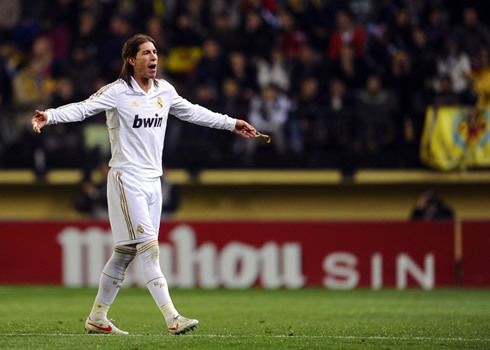 21.03.2012 » Villarreal 1-1 Real Madrid. Could it be more controversial? Real Madrid visited Villarreal this Sunday, but repeated last weekend result, by drawing 1-1 with the "yellow submarine" side. Cristiano Ronaldo scored his 100th goal in La Liga, but the night got stained due to a miserable perfomance from the referee, Paradas Romero, who decided to send off José Mourinho, Rui Faria, Sergio Ramos, Pepe and Mesut Ozil. 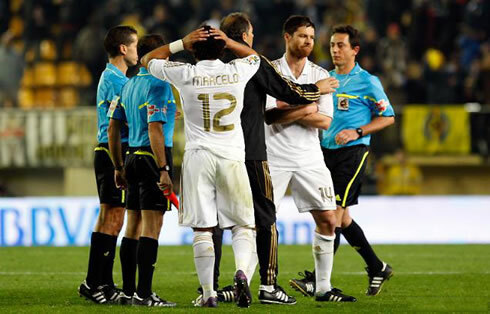 Villarreal and Real Madrid tied 1-1 in the "El Madrigal" this Wednesday night, in what was a very controversial game. Cristiano Ronaldo and Marcos Senna scored the two goals last night, but the spotlights have strangely turned to the referee, Paradas Romero, as he ended sending off Real Madrid's coaches, José Mourinho and Rui Faria, as well as three Merengues players, Sergio Ramos, Pepe and Mesut Ozil. Who must have appreciated last night display at the "Madrigal", was certainly Barcelona, who are now only 6 points behind the league leaders Real Madrid and with still 10 games left to be played in La Liga. 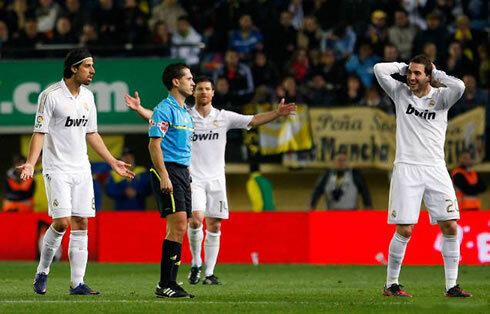 If it's true that the referee (Paradas Romero) played a big role in last night's outcome, it's also true that Real Madrid should take part of the blame for allowing their opponent to feed the belief of drawing a game until the end, and with that, conceding a second slip in a row. Similarly to last weekend's game against Malaga, Real Madrid lacked some of that exuberance that they have showed to the fans througout the entire season and allowed the game to drag until the end undecided, without really putting their opponent against the ropes in any moment. Surprisingly this season, Villarreal is on a dangerous spot in La Liga, as they are still ranked 17th and risking being demoted if they don't improve drastically in the upcoming weeks. The Merengues in the other hand, had an almost flawless record before this match, with 23 wins and only 2 draws and 2 losses. There was much at stake this last Wednesday night and Villarreal approached and looked at this game as an opportunity for making of it a turning point in the season. The first half was well disputed, with Real Madrid clearly having more ball possession, but rarely finding spaces to breach into Villarreal's defense. The most dangerous play was originated from a side free-kick taken by Xabi Alonso, which Pepe headed on the far post and saw being denied by a great interception from Zapata. Apart from that, there weren't any noteworthy plays from José Mourinho's men, which could have been regarded as good chances to score. In the other hand, Villarreal had two or three occasions where Iker Casillas was close to get beaten, but Miguel Lotina's side also failed to make good use to their opportunities. The first-half already counted with a few misjudged calls from the referee, but it's also important to note that they weren't exactly all in Villarreal's benefit. In the 31th minute, Nilmar was pulled by Arbeloa inside Real Madrid's penalty area and it should have been enough for a penalty-kick to be granted to Villarreal. However, that would be only the first of many mistakes made by Paradas Romero last night, as just a few minutes after, the Spanish referee ignored a violent tackle on Callejón, clearly worthy of a direct red card. He would also show a yellow card to Marcos Romero near the 20th minute, but oddly forgot about that, later on during the second half, as he showed the same player a second yellow card but didn't send him off. Half-time had reached with a goalless draw and a desperate need of improvement for Real Madrid. The Merengues started the 2nd half with a slightly different attitude and ended rewarded with a goal in the 62th minute. Who else but Cristiano Ronaldo, to assume the risk, brilliantly combine with Mesut Ozil, before breaching into Villarreal's area and beating Diego López in style. It was Ronaldo's 100th goal scored in La Liga, since his arrival in 2009, but the accomplishment ended losing some of its charm in the remaining minutes that were left to be played in the game. 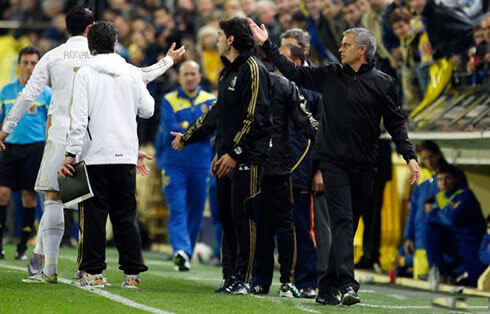 Near the 50th minute, Real Madrid's assistant coach, Rui Faria, had already been sent off from the bench. However, with Ronaldo goal in the 62th minute, Real Madrid appeared to be controlling the game a lot better than before and Villarreal never seemed to be posing a real threat to Iker Casillas. Few surely expected it, but there was a twist coming in this match, reserved for the 82th minute. Just a few instants following Marcos Senna goal, Paradas Romero ordered José Mourinho to leave the pitch, appearently because of a few insults he may have heard from the Portuguese coach's mouth. The game would then resume, but not for long, as it stopped again for a while when Sergio Ramos was shown the second yellow card and respective red card, after a challenge on Nilmar. A few seconds later, Mesut Ozil suddendly also got shown a direct red card, for allegedly clapping his hands near the referee, even though there's still not a single video showing the German player making anything that may justify Paradas Romero's decision. Guti: "If Barcelona wants to win La Liga, we are such gentleman that we'll just give them the trophy, but no more robberies... It's still a 6 points gap and Real Madrid will win it!" Guti: "I'm with Cristiano on this, it's a clear robbery. It's like the 'Malaya' case, but in football"